386 pages | 47 B/W Illus. This book offers an interdisciplinary analysis of the social practice of taste in the wake of Pierre Bourdieu’s sociology of taste. For the first time, this book unites sociologists and other social scientists with artists and curators, art theorists and art educators, and art, design and cultural historians who engage with the practice of taste as it relates to encounters with art, cultural institutions and the practices of everyday life, in national and transnational contexts. The volume is divided into four sections. The first section on ‘Taste and art’, shows how art practice was drawn into the sphere of ‘good taste’, contrasting this with a post-conceptualist critique that offers a challenge to the social functions of good taste through an encounter with art. The next section on ‘Taste making and the museum’ examines the challenges and changing social, political and organisational dynamics propelling museums beyond the terms of a supposedly universal institution and language of taste. The third section of the book, ‘Taste after Bourdieu in Japan’ offers a case study of the challenges to the cross-cultural transmission and local reproduction of ‘good taste’, exemplified by the complex cultural context of Japan. The final section on ‘Taste, the home and everyday life’ juxtaposes the analysis of the reproduction of inequality and alienation through taste, with arguments on how the legacy of ideas of ‘good taste’ have extended the possibilities of experience and sharpened our consciousness of identity. 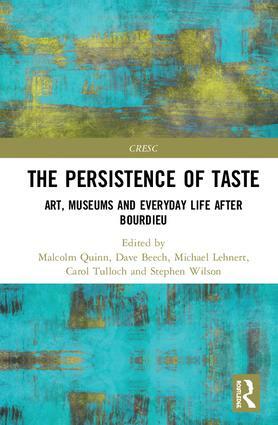 As the first book to bring together arts practitioners and theorists with sociologists and other social scientists to examine the legacy and continuing validity of Pierre Bourdieu’s sociology of taste, this publication engages with the opportunities and problems involved in understanding the social value and the cultural dispositions of taste ‘after Bourdieu’. It does so at a moment when the practice of taste is being radically changed by the global expansion of cultural choices, and the emergence of deploying impersonal algorithms as solutions to cultural and creative decision-making. Malcolm Quinn is Professor of Cultural and Political History, Associate Dean of Research and Director of Camberwell, Chelsea, Wimbledon Graduate School, University of the Arts London. Dave Beech is Professor of Art at Valand Academy, University of Gothenburg, Sweden. Michael Lehnert is an international relations scholar and cultural manager, and is currently a Director of the Palestine Exploration Fund, the world’s oldest scientific organisation dedicated to the archaeology, history and geography of the Levant. Carol Tulloch is Professor of Dress, Diaspora and Transnationalism at University of the Arts London, where she is based at Chelsea College of Arts and a member of TrAIN. Stephen Wilson is a writer, practitioner and theorist who programmes, curates and lectures in contemporary art and is currently a Senior Lecturer and Postgraduate Theory Coordinator at Chelsea College of Art, University of the Arts London.